With all due respect, I am writing this letter on behalf of all the parents to demand free education. 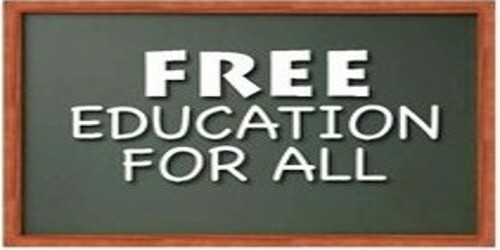 Education is not a privilege but a basic right and everyone has a right to free and good quality education. A lot of parents sacrifice a lot to make sure their child gets a fine education. (Describe in your own words). I know of many cases in which parents sell their assets so they can fund their child’s education which is not an easy task. The heavy tuition fee of schools puts an intense burden on the parent’s shoulders which needs to be lifted. (Explain the actual cause and situation). Along with the heavy tuition fee, parents have to pay for books, supplies and other expenses as well which is troublesome. (Describe your requirements). It is our request to look into this issue and inculcate free education within your system. I hope you will recognize our situation and fulfill our demand. Your institute is one of the prestigious institutes in the city, my son/daughter is studying in your institution from the past five years, (more or less) and s/he is currently in Grade (Name). S/he is a very active student both in studies as well as extra-circular activities. (Describe in your own words). From his/her (previous grade) s/he has been constantly scoring position in his/her class. My son/daughter is very keen to learn and s/he is very excited to start his/her new session but unfortunately we are not able to tell him/her that s/he might have to leave his/her school, it will break his/her heart as well as his/her hopes to work hard. As s/he has always been a pride for his/her teachers and his/her school I want to make a plea to reduce his/her fee and award him/her with a full scholarship. (Explain the actual cause and situation). S/he is an outstanding student of his/her class and I assure you that s/he will maintain his/her position and prove him/herself worthy for free education. (Explain your expectation). We want him/her to continue his/her studies in this institute but due to our financial crises, I am forced to write this application in the hope that my request will be entertained. (Describe your requirements). Anxiously waiting for a positive response, we shall be very grateful to you.